Bulletin is a chronicle of socialist comment and analysis from Jacobinâs Seth Ackerman. For the sake of argument, and because I think itâs probably true, Iâll assume here that the story laid out in Robert Muellerâs twenty-nine-page indictment last week is basically right: Russian intelligence hacked Democratic emails and leaked them to the internet. The goal was to help Donald Trumpâs campaign and generally sow chaos in American politics. But if this was, in fact, an âattack on America,â the reaction to it has been puzzling. Imagine if Russia were to launch a real attack â" say, a surprise strike on a US Navy vessel somewhere in international waters. How would the national security apparatus respond? First, presumably, it would try to figure out Russiaâs motives and guess its next steps. Then calculations would be made about what military and political objectives to seek and how to safely achieve them. Moves and countermoves would be methodically gamed out. And confident declarations of serene resolve would be issued. None of that is happening now. Instead, the mandarins of US power and their acolytes in the commentariat seem to be having a collective meltdown. âThe warning signs are there. The system is blinkingâ¦. I believe we are at a critical point,â national intelligence chief Dan Coats intoned in a recent speech. âThis ought to be a wakeup call to Washington: Putinâs shadow war is aimed at undermining Americansâ trust in our institutions. We know Russia is coming back in 2018 and 2020 â" we have to take this threat seriously,â said Republican senator Ben Sasse. âWe must deal w Putinâs Russia as the rogue state it is,â tweeted Council on Foreign Relations president Richard Haass. Despite ubiquitous demands to âta ke the threat seriously,â none of these voices has plausibly explained what the US ought to do about it. Democratic senator Chuck Schumer demanded that Trump âcancel his meeting with Vladimir Putin until Russia takes demonstrable and transparent steps to prove that they wonât interfere in future elections.â And how exactly would that work? Compare the US reaction to that of elites in Europe. In May, the European Council on Foreign Relations â" an impeccably Atlanticist think tank whose trustees include a former head of NATO and the chairman of the Bundestag foreign affairs committee â" published a report on how to respond to Russia. It singled out French president Emmanuel Macronâs response as a model. France then calmly took practical steps to deal with the problem. Its cybersecurity agency was beefed up. Its national election commission âestablished a mechanism allowing a candidate to request an investigation if it detected a cyber intrusion.â And electronic voting overseas was curtailed as a precautionary measure. It seems clear that the current Beltway panic isnât really a reflection of the magnitude of the perceived threat from Moscow. It reflects panic that someone like Trump could win an election in the United States. And yet, at the very most â" and I doubt this scenario â" Russia could have shaped the outcome only by changing a tiny, marginal number of votes in an election that would have been close anyway. Russian meddling is not the reason Trump was a viable presidential candidate. Back in the 1990s, when US power was riding high and aggressive âdemocracy assistanceâ overseas was all the rage, its evangelists used to ridicule tinpot despots like Slobodan Milosevic who railed against foreign meddling in their politics. That was seen as the ultimate admission of weakness â" of the brittleness of those leadersâ legitimacy. Now those same evangelists issue daily, panicked warnings about the foreign threat to America from leaked emails and Twitter trolls. If Moscowâs goal was to un dermine the legitimacy of the US political system, they, too, are looking a lot like Russian agents at the moment. 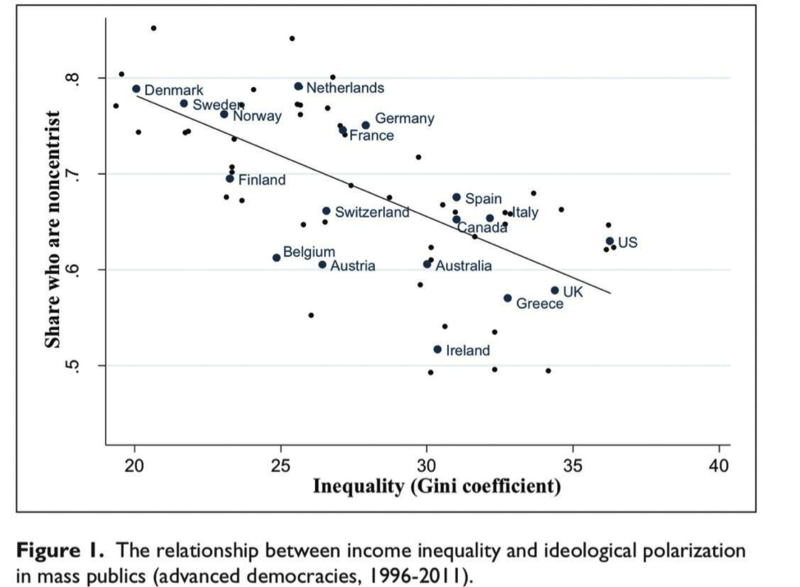 An interesting finding from political scientists Torben Iversen and David Soskice: countries with more centrist politics tend to have higher inequality. See their paper here. I thought for a second and wrote: âTo Jeff Sachs, who is trying to save socialism.â Jeff was kind of shocked, and he said, âI do not want to save socialism; I want to bury it.â I was surprised then but realized later: I was still behind the curve regarding what was happening. I saw the early reforms in Poland as a way to introduce market elements into socialism, the same way that Keynesian economics introduced some state control into capitalism. Pushing the parallel further, I saw the socialist crisis of the 1980âs as a way toward the creation of a reformed and sustainable socialism. But Jeff (rightly) sa w it as the end of socialism and the beginning of the transition to capitalism.